The Boulders’ back garden bordered the Mullen’s outhouses. Double storey, they were in a ramshackle state but provided the neighborhood kids with an adult free zone for hanging out. 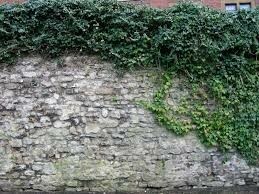 The buildings ran most of the length at the back of our garden and the wall was covered in a matt of luxuriant ivy which provided a verdant backdrop to my Mother’s rockeries. One day, I decided to hack through each of the thick stems that supported the huge plant. I thought I was doing everyone a favour, but I wasn’t quite sure. At dinner one evening, I nonchalantly asked my Mother if she liked the ivy at the back of the garden. Her affirmative response threw me into a state of blind panic. I had to come up with a remedial plan, and fast. Acting independently of my siblings I had to ensure that they didn’t rumble me either. I attached a water-filled paint can to the severed limb, urging it to drink deeply. Camouflaging the paint can to hide my crime and topping it up hourly was in vein. The whole wall turned dark brown as the plant quickly expired. Luckily, no one noticed anything and eventually new shoots covered my misdemeanor.